The radical changes in American society brought about a natural alliance between Trump and the false prophet of Revelation. The Bible helps us understand what is happening and what’s coming. Today we’ll be focusing more specifically on the false prophet. The appearance of the third member of the Evil Trinity on the political scene strengthens my confidence that Jesus is near, even at the door. Bible prophecy for the end time could not be fulfilled without the false prophet. But now every protagonist is on stage for the final drama to unfold. Some of you may be struggling with the statements I made last time about the pope being the anti-christ. Pope Francis is charming and charismatic. But the issue is systemic: the papal system and the hierarchy of cardinals and bishops as well as the Jesuit order. The issue is never with the Catholic people themselves, who love the Lord and do their best to seek Him and serve Him. These truths can be quite shocking if you’ve never before heard that the pope is anti-christ. But it’s a truth that our Protestant founders knew. The Bible description leaves no doubt as to who that beast power is. We’ll see in a moment why the Protestant world has lost sight of this important truth. In today’s study we’re going to pick up where we left off in our last program, by identifying all the issues on which modern-day Protestants have compromised sound doctrine and have drunk the wine of Babylon. (Wherever I say Babylon, hear Rome). We’re going to list out all of the deceptions that the Catholic Church, totally corrupted by pagan influences, brought into the Christian Church and which the Protestant daughters have accepted. Then we’re going to take a moment to understand the political, economic, social and cultural trends which helped to elect Trump as President of the United States. From this dramatically changed American context has emerged a very natural alliance between Donald Trump and the false prophet of Bible prophecy. The US President doesn’t know where this will lead, but God who knew the end from the beginning has given us the roadmap of where this is headed. Revelation 17:2 tells us that in addition to committing fornication with the kings of the earth, the harlot mother church made the inhabitants of the earth drunk with the wine of her fornication. What is that wine? Wine is false doctrines, false teachings, outright lies and deceptions that entered the Catholic Church early on. She absorbed these false teachings and pagan traditions as she assimilated into her ranks the pagan worshippers of the Roman Empire. The Church was weary after many decades of fierce persecution by the Romans and was ready to compromise. She wanted peace and prosperity and to carve out her niche in the midst of the crumbling Roman Empire. What are some of these false teachings and traditions that have entered the Church since then? · Presenting tradition as the basis for beliefs and practices instead of the Word of God: for example, Sunday worship instead of Sabbath worship. This departure from the Word of God opened the door to all of the other heresies and abominations because there was no more standard of truth. · Immortality of the soul: this is a pagan belief. The Bible says that the soul is NOT immortal, that “the soul that sins it shall die” (Ezekiel 18:20). God alone has intrinsic immortality. · The belief that immediately after death the dead go to heaven, hell or purgatory. Instead, the Bible declares that the dead are in a state of unconsciousness or “sleep” until God raises them up at the first or the second resurrection. · Infant baptism and baptism by sprinkling: The Bible says that public confession of Jesus is a requirement for baptism and that the person must be fully immersed in the water to symbolize being buried with Christ and dying to the old self. Infant baptism doesn’t meet any of those criteria and baptism by sprinkling is a counterfeit. · Prophesying in tongues: The belief that receiving the baptism of the Holy Spirit enables each person to have their own prayer language for their own benefit. The Bible says that tongues is the gift of previously unknown foreign languages given to believers for the purpose of witnessing to others and for the edification of the church. · The practice of having praise teams and worldly music: This new practice introduced into the worship service began after the Vatican Council II. According to the Council, the role of music is “to create an experience for the worshippers”, not so much to render homage to our God. The Bible prescribes great reverence before the Lord and says to sing psalms, hymns and spiritual songs. · “Thought to change times and law” (Daniel 7:25). This is one of the biggest and most important deceptions of all. Let’s take a minute to understand what this means. Change the law: the Catholic Church made two changes to God’s Ten Commandments. First, it removed the second commandment which prohibits idolatry, the worship of images, statues, relics, and anything that God didn’t intend for worship. Second, the Church transferred the solemnity of God’s holy Sabbath, His ordained day of rest and worship, to Sunday, the Day of the Sun, which was a pagan holiday. Change times: There are actually two very different kinds of times that are meant here. The first kind of time is related to the day of worship as we just saw, from the 7th day which has God’s blessing to the 1st day which has no sacredness whatsoever in the eyes of God. 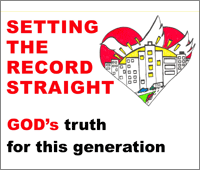 The second kind of time that the Catholic Church changed is God’s prophetic timeline, which is called the historicist method of interpreting Bible prophecy. In the historicist method time is linear or sequential, just as it is in real life. But during the Catholic counter-reformation the Jesuit order tampered with God’s prophetic timeline by introducing Preterism and especially Futurism as methods of interpreting Bible prophecy. The goal of the Jesuits was to vanquish the historicist method because it clearly identifies the anti-christ as Rome. By tampering with prophetic interpretation the very clear Bible clues leading to the identity of the anti-christ were lost. Both Preterism and Futurism blur the historical trail that leads to the correct identity of the anti-christ and disregard all the clear Bible evidence as to who the anti-christ is. · The Secret Rapture: This false teaching doesn’t come directly from Rome but originated in the Pentecostal movement in the 1800’s. The Secret Rapture teaching states that the Church will be whisked off before the Great Tribulation and taken to heaven and that only the Jews and the wicked will be left behind to suffer through the tribulation here on earth. This is contrary to clear Bible passages which state that the Church will be present on earth for the Great Tribulation. On all of these points Protestants and Evangelicals have departed from sound doctrine and are drinking the wine of Babylon. Listen to what the Lord says through the prophet Isaiah, lamenting the spiritual drunkenness of the shepherds and their lack of solid instruction in God’s Word. The prophets and priests themselves are still drinking baby milk instead of eating the strong meat of the Word of God. How could they feed their congregations if they themselves are still babies in the Word? “(To) Whom will he teach knowledge? In the heart of true Protestants the protest against Rome isn’t over, even though pope Francis would like it to be. Never forget that pope Francis is a Jesuit. The stated agenda of the Jesuit order is to exalt the role and the person of the pope and to do away with Protestantism. Isn’t that exactly what pope Francis is doing? With iron fist in a velvet glove, he’s succeeded in getting most of the Protestant world to agree with him that “the protest is over”. Let’s now take a very quick look at how dramatically American culture and values have changed over the past few decades, and how this contributed to Trump’s election. Until the 1950’s, US society was dominated by the proverbial white middle-class family with the working father and the stay-at-home mom who raised the kids. One of the most important characteristics of that family unit was their faith. 68% were Protestant, 23 percent Catholic, and 4 percent Jewish, according to sociologist Will Herberg. These families identified themselves with their faith and church attendance was quite high during the 1950’s. In 1955, 42% of Protestants and 75% of Catholics attended church regularly. In 1954 the term “under God” was added to the Pledge of Allegiance. Fast forward to the US of today. The “traditional” Christian views about abortion, marriage and gender have become almost irrelevant. The liberal left dominates the media and is vociferous about its agenda. Mainstream media is also saturated with anti-religious prejudice. The Obama Administration pushed the liberal agenda to the extreme with laws like gay marriage and mixed gender bathrooms. Conservative Protestants were feeling very frustrated with their waning influence in American public life. Not only that, a tangible anti-religious sentiment is permeating the US culture presently. Any Christian who dares take a stand against serving LGBT customers in his/her business or indeed says anything against the gay lifestyle is called a “hater”. All Christians in America are exposed to this religious intolerance. It’s become politically incorrect to mention one’s faith. Last Christmas I published an article on the City Bible Group blog about a family in Pennsylvania who were fighting back and keeping their Christmas display after a neighbor complained to the HOA that the display was “offensive”. There’s a very prophetic Bible verse in the Book of Isaiah that says: “Woe unto them that call evil good, and good evil; that put darkness for light, and light for darkness; that put bitter for sweet, and sweet for bitter!” (Isaiah 5:20). This was the socio-political climate of the country when Trump was contending for the presidency, and still is today. Hillary Clinton was representing the liberal agenda and had the backing of most of the mainstream media. As you may remember all of the opinion polls were giving Hillary the victory. Donald Trump’s support within the Republican Party was not unanimous, and he needed a trump card. Trump made an alliance with Evangelical Protestants. In June of 2016 he met with nearly a thousand social conservative leaders in New York City involving nearly all the traditional political influencers of the religious right, according to Time Magazine. He also recaptured the Catholic vote, up to 52% from 45% in the previous elections. It was Christians who gave Trump the victory. In the same article in Time Magazine, Paula White stated that the reach and commitment of the Daystar Network broadcasting across the US and Jerusalem, combined with the use of social media by all the leading pastors supporting Trump, were the clinchers in mobilizing Evangelicals to vote for Trump. Many of those pastors also led their congregations in prayer and fasting on behalf of Donald Trump. Many of them had dreams and visions about Trump winning the elections. They all had a sense of positive expectation and faith that Trump would overtake Hillary despite all of the mainstream media being in her favor. It’s “divine appointment”, “divine intervention” and “divine providence” that Donald Trump became President of the US, according to these Evangelical leaders. Now I do agree with Evangelicals that there’s something divinely ordained about Trump’s victory, but for different reasons. Search for my podcast called “Trump: What’s in a name”. In that podcast I explain why I do believe Donald is the Trump of God. But I mean that in a very different way from what the Evangelicals are proposing. I believe that President Trump’s name is a trumpet announcing what’s to come. In other words, his name and therefore his presidency serve the same purpose as the Hebrew Feast of Trumpets in the Jewish religious calendar. His name announces the imminent Day of Judgment. 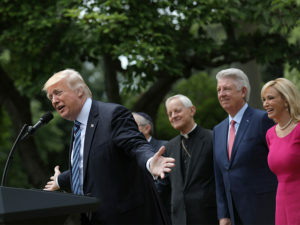 · He tried to push through the repeal of the Johnson Amendment, but because it was put forth as part of a tax bill it was rejected. The Johnson Amendment is a law forbidding non-profit organizations to make donations to political parties and candidates. It establishes a financial separation between church and state. Trump wanted to repeal that law to give Evangelicals more say by giving them the possibility to fund political campaigns while still maintaining their tax-exempt status. We’ll see whether the President will try to present that again in a different way. · He has named a number of conservative pro-life judges to district courts and two to the Supreme Court (his latest nominee Judge Kavanaugh is still pending confirmation). · One of the most important privileges Trump has given the Evangelical community is direct access to himself. He set up an Evangelical Advisory Council with some of the leading Evangelical pastors and meets with them frequently. They’re in frequent contact with White House staff through phone, text and email and are invited to meetings at the White House. Occasionally they pray with the President and lay hands on him. These Evangelical leaders are able to present their views on different policy matters and make requests and recommendations to the President. There are two very interesting developments in the Trump and Evangelicals story. In May of 2018 Trump moved forward with the relocation of the US Embassy from Tel Aviv to Jerusalem. This represents an official recognition by the US that Jerusalem and not Tel Aviv is the capital of Israel. I believe this was another seed planted by our Evangelical friends who believe that end time prophecy will be fulfilled in the Middle East. They’re waiting for the Jerusalem temple to be rebuilt and in their view the US recognition of Jerusalem is an important building block in the reconstruction of the temple. In my opinion this is a tell-tale sign of the influence that Evangelicals have over Trump. What is happening here? As we said earlier, Evangelicals are reacting against their loss of influence and the erosion of religious liberty. They’re also reacting against the prevailing hostility against Christianity. Trump is listening and is setting up this religious freedom taskforce that’s just been announced. So far, so good – there’s nothing intrinsically wrong with the setting up of a task force on religious liberty. However, in the context of everything we’ve said and all the subtle and not so subtle ways in which Trump is opening the doors of the White House to evangelicals, we need to keep our eyes on this task force and see how it evolves, what proposals and recommendations they’ll put forth. What I see happening in the Trump Administration is a still emerging but strong trend towards the union of church and state. It’s starting gradually but I’m convinced it will continue to develop and accelerate. Evangelical Protestants are beginning to have considerable influence over the US head of state. In other words, the church is beginning to overstep the boundaries of her marriage with Christ and is starting to seek another power, the power of the state. So far we’ve done a deep dive into current events. Now we have to go back to the Bible to decode what all this means in the light of Bible prophecy. God’s point of view on church and state may appear counterintuitive. You’d think that God would want to take control of the state or the civil power so that the citizens of every nation on earth would be Christian, commandment-keeping people. Not so. God’s kingdom is a spiritual kingdom. It can’t be amalgamated with the earthly kingdoms. God recognizes two kingdoms: the kingdom of heaven and the kingdoms of the world, the church and the state. For God, they must be completely separate. He commanded us to obey the government (Romans 13:1) as long as it doesn’t contradict God’s law. Our civil obedience includes paying our taxes (Matthew 22:21). “Let every soul be subject to the governing authorities. For there is no authority except from God, and the authorities that exist are appointed by God” (Romans 13:1). It’s God who appoints rulers: “He removes kings and sets up kings” (Daniel 2:21). The Lord did ask us to pray for our leaders in 1 Timothy 2:1: “Therefore I exhort first of all that supplications, prayers, intercessions, and giving of thanks be made for all men, for kings and all who are in authority, that we may lead a quiet and peaceable life in all godliness and reverence”. Other than praying for our political leaders, God doesn’t want His Church having any direct interference with the state or to be seeking political power. He alone is the source of the Church’s power which should be restricted to spiritual influence. It’s when the Church becomes disconnected from her source of power that she becomes weak and tries to compensate for her weakness through legislation and political influence. When the Church does that in the Lord’s eyes she becomes a harlot who fornicates with the kings of the earth. We’re going to consider a couple of passages from the Book of Daniel where the Bible illustrates very clearly what happens when church and state are united and how easy it is for kings and rulers to fall into that temptation. These stories in the Book of Daniel are historically true but also prophetic. Let’s begin with the story of the three Hebrew young men. We don’t have time to consider all the details of this beautiful story told in Daniel Chapter 3. We’ll only highlight the aspects related to the union of church and state. After Daniel had given Nebuchadnezzar the interpretation of the dream, he went away to ponder it. The king didn’t like the revelation that his kingdom, the head of gold, would be overtaken by another kingdom represented by the silver arms and chest and would come to an end. He decided that he was going to have the final say in the matter. Nebuchadnezzar commanded an enormous statue to be built entirely of gold, to tell the God of heaven that He was wrong and that Nebuchadnezzar’s kingdom would last forever. Worship was to be made to the statue, the statue being an image of the king. We know the end of the story: the three Hebrew young men, aided by their plant-based diet which we read about in Chapter 1 of Daniel, refused to bow down to worship the statue. Nebuchadnezzar ordered them to be thrown into a fiery furnace and Jesus Himself came into the fire with them and brought them out unscathed. Once Nebuchadnezzar had seen the miraculous deliverance wrought by the Son of God (in fact Nebuchadnezzar acknowledged and recognized the fourth man walking in the fire as the Son of God), he then issued another decree to enforce worship to the God of heaven: “Therefore I make a decree that any people, nation, or language which speaks anything amiss against the God of Shadrach, Meshach, and Abed-Nego shall be cut in pieces, and their houses shall be made an ash heap; because there is no other God who can deliver like this” (Daniel 3:29). 1. At the beginning of the story King Nebuchadnezzar united church and state by commanding a law to enforce worship. Worship should never be enforced by law. 2. When the people worshipped the image, they were in fact worshipping Nebuchadnezzar because the statue represented him. The head of state became at the same time the head of the national religion. The two roles were combined in the same leader. 3. At the end of the story, Nebuchadnezzar again issued a global decree to all peoples, nations and languages that they should honor the God of heaven. The second story we want to consider is how Daniel ended up in the lions’ den. Listen closely now, this is an amazing story, which we find in Daniel Chapter 6. Daniel was one of three governors that handled the affairs of Medo-Persia, the kingdom which succeeded Babylon as the largest world empire. King Darius was very impressed with Daniel’s competence wanted to put him in charge of the whole kingdom, similar to how Pharaoh in Egypt had put Joseph in charge of the whole nation. “So these governors and satraps thronged before the king, and said thus to him: “King Darius, live forever! All the governors of the kingdom, the administrators and satraps, the counselors and advisors, have consulted together to establish a royal statute and to make a firm decree, that whoever petitions any god or man for thirty days, except you, O king, shall be cast into the den of lions. Now, O king, establish the decree and sign the writing, so that it cannot be changed, according to the law of the Medes and Persians, which does not alter.” Therefore King Darius signed the written decree”. What was Daniel’s response when he heard of this decree? “Now when Daniel knew that the writing was signed, he went home. And in his upper room, with his windows open toward Jerusalem, he knelt down on his knees three times that day, and prayed and gave thanks before his God, as was his custom since early days” (Daniel 6:10). Of course the evil satraps or administrators came back to the King with the evil report. King Darius felt miserable with himself that he had allowed himself to be tricked. But it was too late now. The law of Medo-Persia was unchangeable, the King couldn’t alter the decree in any way. (Makes you wonder why Christians can accept that the law of Medo-Persia can’t be changed but the law of heaven can….). At this point, King Darius has no choice but to order that justice be done, and that Daniel be cast into the den of lions. “But the king spoke, saying to Daniel, “Your God, whom you serve continually, He will deliver you” (Daniel 6:16). Then Daniel said to the king, “O king, live forever! My God sent His angel and shut the lions’ mouths, so that they have not hurt me, because I was found innocent before Him; and also, O king, I have done no wrong before you. Now the king was exceedingly glad for him, and commanded that they should take Daniel up out of the den. So Daniel was taken up out of the den, and no injury whatever was found on him, because he believed in his God” (Daniel 6:8-23). 1. He ordered that the evil administrators responsible for Daniel’s captivity be thrown into the lions’ den with their wives and children. The lions were very hungry and tore them to pieces even before they reached the bottom of the den. 2. King Darius issued a decree throughout the kingdom. “Then King Darius wrote: To all peoples, nations, and languages that dwell in all the earth: Peace be multiplied to you. I make a decree that in every dominion of my kingdom men must tremble and fear before the God of Daniel” (Daniel 6:25-26). · Early in the story King Darius issued a decree forbidding that any should pray to anyone except himself. · At the end of the story, after seeing the power of the God of Daniel, he issued a decree throughout his empire to impose worship to the God of Daniel. This was a global decree addressed to all peoples, nations and languages. Now there’s one more common element in both stories: persecution. King Nebuchadnezzar threw into the fiery furnace those three young Hebrews who refused to bow down and worship his image. King Darius was forced to throw Daniel into the lions’ den because he persisted in praying to his God, when prayer to anyone other than the king had been legally proscribed. The union of church and state always results in persecution. Make no mistake about it. These two stories don’t just happen to be in the Book of Daniel. They’re both prophetic of what will happen very soon in America, and through America’s influence it will spread to the rest of the world. Those who don’t learn from history are doomed to repeat it. Listen to what it says in the First Amendment of the US Constitution: “Congress shall make no law respecting an establishment of religion, or prohibiting the free exercise thereof”. Yet that is exactly what’s going to happen as the US government progressively becomes entangled with Apostate Protestantism, the iron mingled with clay. The US will make a law establishing Sunday as the official day of worship for the entire nation, that will be the first step. Subsequently it will ban the keeping of the Sabbath or any day of worship other than Sunday. Those who do not embrace Sunday worship will be marginalized from the economy and won’t be able to buy or sell. Ultimately the death decree will be issued against those who persist in civil disobedience, those who choose to obey God over men. This is how the US that has two horns like a lamb will end up speaking like a dragon. The land beast – the US – will be controlled by the false prophet – Apostate Protestantism. The false prophet is controlled by Rome and is pushing Rome’s agenda on the US government. The false prophet will be allowed to work signs and wonders to assert its credibility. Rome or the anti-christ power in turn is controlled by the dragon. It’s Satan himself that receives worship on Sunday, the day of the sun god. The US government will influence the rest of the world to follow its example and legislate Sunday as a national day of rest. That’s how the US heals the wound of the beast and restores the anti-christ’s global power. The US, in raising an image of the beast, assumes the same power to persecute and kill as did Rome in the days of old. This is all described in Revelation 13 and 17. Do you see how all the pieces fit together? In the story of Esther and Mordecai a death decree was passed against God’s people who refused to bow down to Haman. There will also be a death decree issued against God’s remnant who refuse to bow down to the image of the beast and refuse to take his mark. Then Jesus comes to deliver His people from death and rescue His bride in distress. I hope this is giving you some deep insight as to what we can expect, and why we need to be watching and praying! There’s one more Bible story that has a similar template or pattern to what will happen at the end of time. Almost every Bible story has a pattern God’s people going through a time of trouble, with most being delivered except for one notable exception: John the Baptist. And this even though Jesus said that there was none greater than John the Baptist (Matthew 11:11, Luke 7:28). The story of John the Baptist is particularly relevant for us because John the Baptist was the second Elijah. There will be a third Elijah, the end time Elijah. The spirit of Elijah is the spirit of revival and reformation in the Church. God’s people will go forth to preach the Three Angels’ Messages of Revelation 14 in the power and the spirit of Elijah. John the Baptist had denounced the sin of King Herod who married his brother’s wife Herodia and was therefore living in adultery. Herodia, the adulteress who fornicated with the king, hated John the Baptist because he called out Herod on his sin. But she knew that Herod respected John and protected him, so she couldn’t go after John herself. She worked through her daughter to seduce King Herod through her dancing and obtain the head of John the Baptist. After Herodias’ daughter (presumably named Salomé) pleased the king and his guests with her dancing, Herod said to her: “Ask me whatever you want, and I will give it to you.” He also swore to her, “Whatever you ask me, I will give you, up to half my kingdom.” So she went out and said to her mother, “What shall I ask?” And she said, “The head of John the Baptist!” (Mark 6:22-24). “And the king was exceedingly sorry; yet, because of the oaths and because of those who sat with him, he did not want to refuse her. Immediately the king sent an executioner and commanded his head to be brought” (Mark 6:26-27). What’s the pattern here? The harlot mother, just like the harlot church of Revelation 17, doesn’t have the power to influence the king (i.e. the President) directly. The harlot mother sends her daughters to work the king, but it’s really the mother pulling the strings in the background. The king (i.e. the President) is seduced by the harlot daughters (i.e. 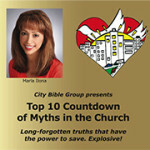 the harlot churches of Revelation 17) and yields to them until he issues the death decree against God’s end time people. “And I saw the beast, the kings of the earth, and their armies, gathered together to make war against Him who sat on the horse and against His army. Then the beast was captured, and with him the false prophet who worked signs in his presence, by which he deceived those who received the mark of the beast and those who worshiped his image. These two were cast alive into the lake of fire burning with brimstone” (Revelation 19:19-20). Trump is in the process of uniting church and state. His name clearly announces judgments to come upon America and the world. Evangelicals are slowly but surely consolidating their power and influence over Trump. They don’t know that they’re being used by the power of Satan to accomplish his own ends. They have forgotten that Rome is a persecuting power that will resume her persecutions as soon as that deadly wound is completely healed. Evangelicals have learned from Rome how to put aside their theological differences and to unite on a political platform, not a spiritual platform. The false prophet, who as we’ve said is Apostate Protestantism, will be allowed to work signs and wonders on behalf of the anti-christ beast. The whole world will drink the wine of Babylon. Babylon deceives the nations with her sorceries. The whole world wonders after the beast. But although God’s people will be brutally persecuted, the latter rain of God’s Holy Spirit will be poured down without measure, in all its fullness, to warn the world about the impending destruction of Rome. The loud cry of Revelation 18 will be given with great authority and boldness. In Revelation 16:12 we read about the sixth plague that God sends upon the earth. “Then the sixth angel poured out his bowl on the great river Euphrates, and its water was dried up, so that the way of the kings from the east might be prepared”. The Euphrates River is code language for the people, multitudes, nations and tongues upon which the harlot sits. God’s people hear His voice. They will come out of her and leave her desolate. “Therefore her plagues will come in one day—death and mourning and famine. And she will be utterly burned with fire, for strong is the Lord God who judges her” (Revelation 18:8). “Then the seventh angel poured out his bowl into the air, and a loud voice came out of the temple of heaven, from the throne, saying, It is done! And there were noises and thunderings and lightnings; and there was a great earthquake, such a mighty and great earthquake as had not occurred since men were on the earth. Now the great city was divided into three parts, and the cities of the nations fell. And great Babylon was remembered before God, to give her the cup of the wine of the fierceness of His wrath” (Revelation 16:17-19). Tagged Administration, anti-christ, Babylon, beast, Bible, Catholic Church, church, church and state, Daniel, Donald Trump, elections, end time, Esther, Evangelical, Evangelicals, false prophet, God, Haman, Jesuit, Jesuits, Jesus, John the Baptist, King Darius, Mordecai, Nebuchadnezzar, papacy, persecution, Pope, prophecy, Protestant Reformation, religious persecution, Revelation, the Lord. AWESOME MESSAGE, PRAISE GOD, THANK YOU JESUS! Praise the Lord, He gets all the glory. PLEASE SHARE IT with your friends and anyone who’s being deceived by the lies of the enemy. God is calling His people out of Babylon! God hates lying. The commandments inveigh against lying. Bearing false witness is related to many other sins. Donald Trump has lied more than any other president in our history. He is also extremely profane, taking God’s name in vain, using the F-word abundantly, and is full of abominable pride, refusing to listen at times even to his own hand-picked counselors. His business empire, campaign and his tenure in the White House are all under investigation. His campaign aides have been indicted, tried and convicted of felony crimes. Trump almost never attends church and rarely uses the name of God in his public addresses. Trump was vile when he entered office and is becoming more vile by the day. And this is the man, you say, who is God’s chosen, His annointed? Thank you so much for taking the time to share your thoughts. First let me clarify that I have NOT said that Trump is God’s anointed. Here’s what I DID say in this program: “Now I do agree with Evangelicals that there’s something divinely ordained about Trump’s victory, but for different reasons. Search for my podcast called “Trump: What’s in a name”. In that podcast I explain why I do believe Donald is the Trump of God. But I mean that in a very different way from what the Evangelicals are proposing. I believe that President Trump’s name is a trumpet announcing what’s to come. In other words, his name and therefore his presidency serve the same purpose as the Hebrew Feast of Trumpets in the Jewish religious calendar. His name announces the imminent Day of Judgment”. -I don’t endorse any of Trump’s personal or “social” behaviors. -I fully support Trump’s anti-globalist policies, because God is against globalism. In Genesis 11 the Lord scattered the people and divided them by creating different languages. Why? Because when men come together to do things on a global scale they do it for evil and not for good. Please refer to Genesis 11, especially verses 5 – 9. -I do believe that the Lord caused him or allowed him to be elected President of the United States. Remember that the Bible says: “He removeth kings, and setteth up kings” (Daniel 2:21). No world leader comes into power without the Lord’s permission, especially to lead a global superpower like the US. This would not be the first time that the Lord has used world rulers – including evil or pagan rulers – to accomplish his purposes: God used Pharaoh to show His power over him. God used Nebuchadnezzar, another cruel pagan king, to bring judgment upon Israel and to be a channel for end time prophecy. Subsequently the Lord used the king to show His glory as Nebuchadnezzar was converted. God also used Cyrus, a heathen king, to deliver the children of Israel from Babylon and bring them back to Jerusalem. God actually called Cyrus “His anointed”. So the Lord can use whoever He will to accomplish His purposes. -I believe Trump’s name is part of the revelation of end time events. The name has many layers of meaning. In past programs I’ve focused mainly on the “trumpet” aspect of it. In future programs I’ll be considering others aspects of the word “trump” and how they illustrate the very peculiar role of his presidency. In summary, Trump’s presidency is a very big and complex topic. I’ll continue to deepen my analysis of his presidential actions, analyzing them against the template of Bible prophecy for the end time. Thank you again JP and I hope that you’ll continue to tune into our podcast.